Neuropeptide Y is a 36 amino acid peptide neurotransmitter found in the brain and autonomic nervous system. NPY has been associated with a number of physiologic processes in the brain, including the regulation of energy balance, memory and learning, and epilepsy. The main effect is increased food intake and decreased physical activity. NPY is secreted by the hypothalamus, and in addition to increasing food intake, it increases the proportion of energy stored as fat and blocks nociceptive signals to the brain. NPY also augments the vasoconstrictor effects of noradrenergic neurons. Neuropeptide y (NPY) is a peptidic hormone that can be found in central, periferical and autonomic nervous system. It is mainly secreted by NPY/AgRP cells of the paraventricular nucleus (PVN) and arcuate nucleus (ARC) of the hypothalamus, but also it is the neurotrasmettitor of many interneurons of mammals nervous system. It has many elements and functions in common with YY peptide and pancreatic polypeptide and it is made by 34 amminoacids. They are all coupled to Gi/0 proteins. Npy has an important role in feeding because of its action on the center of feeding in the brain, by the linking to Y1 and Y5 receptors. The effects of NPYergic activity on food intake is also demonstrated by the blockade of Y1 and Y5 receptors (2;2010 Oct), which, as was expected, inhibited NPYergic activity and the food intake. Moreover the food intake is regulated by Y2 receptors, that down-regulate the release of NPY after the binding of YY peptide, that inhibit its action. The NPY gene transcription is activated by Ghrelin (by generation of ROS that act like transcription factors in NPY/AgRP cells) and glucocorticoid hormones (by the binding of II glucocorticoids receptors, which are activated only by relatively high levels of glucocorticoids) and inhibited by Leptin. Hypothalamic NPY stimulates feeding, inhibits thermogenesis and increase the release of insulin and corticosteroid hormones (by CRH); it also stimulate the metabolism of cholesterol. In obese people, NPY binds Y2 receptors on adipocytes and on endothelial cells of adipose blood vessels and stimulate the growth of abdominal adipocytes. It is also possible to say that stress stimulates the growth of fat tissue by production of high levels of glucocorticoids that stimulate the production of NPY. Another point of view is about the structure of NPY, because a rare polymorphism (Leu7Pro;1998 Dec) of the gene is associated to high quantities of blood cholesterol and LDL. In-spite of this, NPY has also a role in anorexia nervosa, maybe because of the strong limbic system inhibiting influence on the orexigenic effect of NPY and on food intake in some people. NPY gene is also expressed by ippocampal cells, amygdala and neocortical cells (in particular interneurons) that express g-aminobutirric acid (GABA). 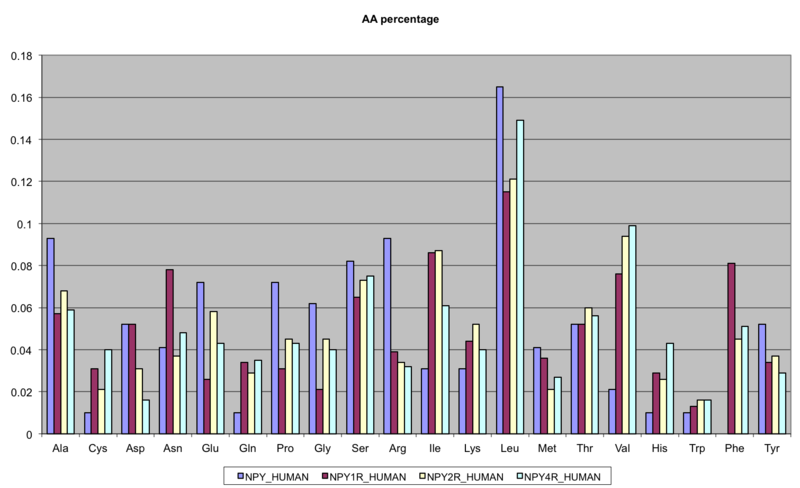 NPY receptors are densely concentrated in the strata radiatum and oriens of Ammon's horn of rats and humans. Epilepsy is a neurological disorder characterized by an imbalance between excitations (mediated by glutamatergic synapses) and inhibitions, that are mediated by GABA synapses. Another point of view is the enhanced expression of NPY mRNA in many areas of brains of epileptic patients (like hippocampus, cerebral cortex and the amygdala) that mediates an endogenous anticonvulsant effect. Actions of neuropeptide Y (NPY) and a Y2 antagonist in rat hippocampal slices. A: effect of npy on the population excitatory postsynaptic potential (pEPSP) evoked by electrical stimulation of stratum radiatum in area CA2, recorded extracellularly in area CA1. Black trace, control response; red trace, response in the presence of 1 mM NPY; blue trace, response to NPY in the presence of the Y2-receptor antagonist, BIIE 0246 (100 NM). B: effect of NPY on primary afterdischarges (18 ADs) in the stimulus train–induced bursting (STIB) model in rat hippocampal slice. extracellular recording from area CA3 shows tonic–clonic 18 AD in control (left trace) in the presence of NPY (300 nm) (center trace), and in 300 nm NPY after pretreatment with BIIE 0246 (100 NM). C: time course of the inhibition of the 18 AD by NPY (300 nm) in the absence (red circles) and presence (blue triangles) of BIIE 0246 (100 nm). (B and C modified from ref. 53, with permission). As we said receptors of NPY are located three key locations in the brain that deal with stress: the amygdala, the hippocampus, and the locus coeruleus; in the amygdala, increased NPY levels may be associated with decreased feelings of anxiety. Patients with PTSD show low concentration of neuropeptide y in cerebrospinal fluid (11;2009 Oct); this discovery demonstrated that it is implicated in many emotional processes like anxiety, depression and also in concentration. The interaction with NPY and CRH (NPY antagonizes CRH) is the key event that can control the emotional state of the patient: CRH receptors are found throughout the brain, in areas specifically associated with stress reactions, such as the amygdala and the locus coeruleus. In locus coeruleus, CRH causes an increase in firing rate and in norepinephrine levels, while NPY has a counter effect, resulting in decreases in rate and level. DPPIV is a Y2/Y5-selective agonist. Expression of NPY receptors (mainly Y1, Y2 and Y5) is enhanced in human breast carcinomas; Y5 receptor is involved in growth (via ERK pathway) and increased migration in human breast cancer cells. NPY has also a role in modulating the immune system. In particular it can inhibit the production of IL-1β by microglial cells; this effect is exclusively mediated by the binding to Y1 receptors. NPY inhibits nuclear translocation of NF-κB after IL-1β challenge. A, confocal microscopy photomicrographs of microglial cells treated with 1 μm NPY and 1.5 ng/ml IL-1β for 15 min were taken to assess the role of NPY and IL-1β in the NF-κB signaling pathway. Cells were stained for NF-κB (in green), for CD11b (in red), and with Hoechst 33342 (nuclei in blue). Nuclear translocation of NF-κB was promoted by IL-1β and inhibited when cells were treated with NPY. Orthogonal sections show nuclear localization of NF-κB (in green). Scale bar, 10 μm. B, Western blotting analysis was performed to study the inhibitory effect of NPY on NF-κB (65 kDa) nuclear translocation upon IL-1β stimulation. After IL-1β challenge, a significant increase in NF-κB protein levels was observed. When cells were treated with NPY, the amount NF-κB was reduced to values comparable with control. A representative blot is shown below the graph. Data are expressed as mean ± S.E. 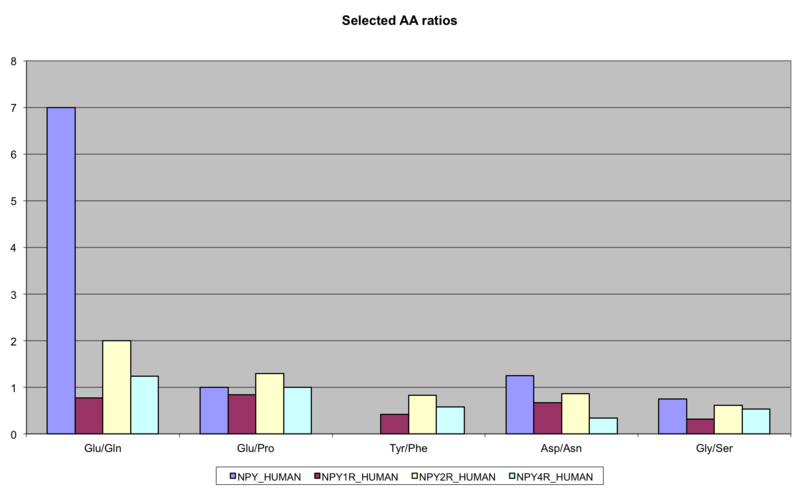 (n = 3) and as a percentage of control (*, p < 0.05, using Bonferroni's multiple comparison test). Dorsal roots neurons produce NPY in response to inflammation (inflammatory pain) and after a nervous damage (neuropathic pain). This effect is exerted by Y1 receptors, in particular located on a group of glutamatergic interneurons in the superficial dorsal horn laminae and by the Y2-mediated inhibition of Ca2+ channel currents in dorsal root ganglion neurons. NPY has been founded in many sympathetic ganglion neurons, in a high number of neurons of parasympathetic cranial ganglia and in cells of intramural ganglia of the enteric nervous system. It is present in large electron-dense vesicles and is released at high-frequency stimulation. NPY affects not only vascular tone, frequency and strength of heart contractions, motorics and secretion of the gastrointestinal tract, but also has trophic effect and produces proliferation of cells of organs-targets, specifically of vessels, myocardium, and adipose tissue. In cardiac desease (induced by hypertension) NPY was recognized as an important mediator released from sympathetic nerves in the heart, affecting coronary artery constriction and myocardial contraction, via Y1, Y2 and Y5 receptors. Its levels in plasma become elevated due to the increased sympathetic activation present in stress-related cardiac conditions. Neuropeptide Y co-exists and co-operates with noradrenaline in perivascular nerve fibers. NPY is involved in many physiological and pathological functions and it can be used as a marker in serum to make diagnoses. High or low levels of NPY in blood can be linked to many pathological states, because its systemic effects. Stress-conditions are very dangerous also because of high levels of NPY that can lead to obesity, type 2 diabetes, systemic high blood pressure, immune weakness and cardiac disorders and because its antagonist action against CRH. Another interesting thing is the link between tryptophan and NPY: synthesis of NPY needs that aminoacid.